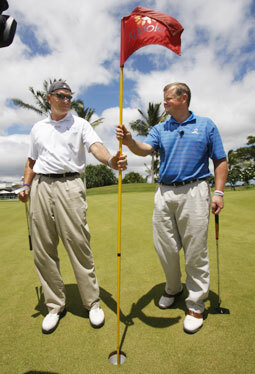 After golfing 900 holes across the country, Bill Evans and Craig Forney took their last stroke at the Kapolei Golf Course yesterday, bringing their awareness campaign to an early close. Send contributions to 50 in 50 Inc. at 4060 Peachtree Road, Suite D333, Atlanta, GA 30319; call (877) 949-5050; or to become a sponsor visit www.the50in50.com. The Atlanta golfers first teed off in Vermont in their 50 in 50 campaign to play a golf course in each of the 50 states in 50 days to raise awareness of melanoma, breast cancer and prostate cancer. It took them 44 days. "I could do 50 more," joked Evans, an entrepreneur. Fifty-one-year-old Evans said he is "fried," and that the next time he looks at his bag of clubs will be "probably to put it in my basement." Forney and Evans hauled their golf clubs out at 5 a.m. to meet an arduous travel schedule that sometimes had them playing a round of golf at courses in two different states on the same day. They traveled on their bus to the contiguous states and flew to Alaska and Hawaii. "We felt like this was a good cause to give back to," said Forney, a PGA golf professional. "I think that everybody needs to look inside and say, 'What can I do for others without having to get something in return?'" They're doing it to raise awareness of breast cancer, prostrate cancer and melanona. Hawaii is the last stop on their tour. Although the campaign ended early, Evans will return home today after a possible visit to Kapiolani Hospital's cancer ward. Forney flew home yesterday to tend to a son with a broken elbow. With a goal of $1 million, the 50 in 50 project collected large and small donations across America. In Groton, Conn., a man emptied his pockets to donate $3. Yesterday the golfers earned $200 more from Lastminutegolfer.com, a Web site that pledged $100 for each birdie made on the tour. Besides some sponsorships, Forney and Evans are paying for the majority of their travel expenses. Do not ask them how much they have raised. 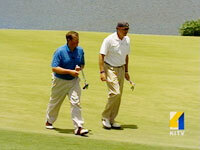 The two golfers said they have not stopped to count. "The money is great, that's what we want," Evans said. "If we don't raise a dime and somebody will go and get screened for any of these cancers and a life is saved, then the trip is worth it." Proceeds from this tour will go to cancer research, but donations will be accepted year-round at their nonprofit organization. Perhaps more valuable than any monetary donation are the personal stories shared by cancer patients, survivors and other philanthropists -- stories from people like Lynn Yonemitsu and Edgar Miner. "I didn't think we'd be golfing today," said Yonemitsu. She met Evans on a Delta flight the night before. After hearing about their work with the Make-a-Wish Foundation, Evans invited Yonemitsu and her boyfriend, Edgar Miner, for a round of golf. Two Atlanta golfers, Craig Forney, left, and Bill Evans, set out to play 50 rounds of golf in 50 states in 50 days to raise money and awareness for cancer. 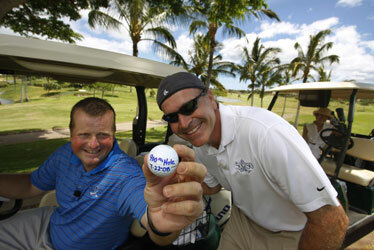 They finished their trip early yesterday -- after just 44 days -- at the Kapolei Golf Course. In September, Miner will host a Make-a-Wish Foundation family whose child has terminal cancer. Yonemitsu and Miner said they were inspired by Evans and Forney to give more. Evans and Forney are already planning another abridged tour next year. For now, the two friends hope this year's tour will inspire people to get screened for cancer. "People ask us all the time what's our motivation." Evans added, "Potentially we could help save someone's life. And you couldn't put a value on what a person's life is worth."